The results from the MRI showed that an impressively large tumour was invading the left, dorsal and back areas of her skull and was compressing her brain. These images were suggestive of a multilobular osteochondrosarcoma, which is a rare skull tumour found in dogs. Although this type of tumour does not metastasise (spread to other parts in the body) easily, its impacts are considered severe. Abdominal ultrasound and chest radiographs were performed to check that Dixie did not have metastases or another sinister problem and partial surgical debulking of the tumour was attempted. Our neurosurgeons established that a complete resection of the tumour was not possible given that the tumour invaded some important vessels of the skull and brain. 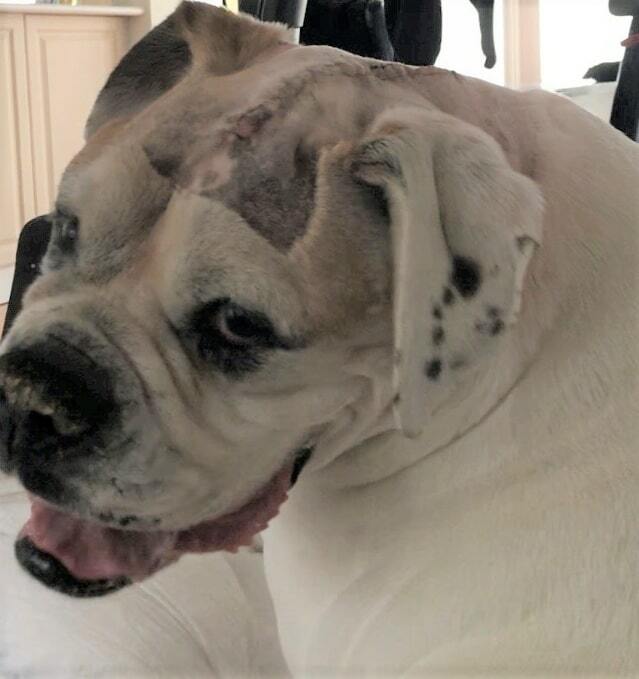 With this information, Dixie’s owners chose to attempt a resection to buy her some time and improve her quality of life for the following months. Approximately three-quarters of the tumours could be retrieved, and the procedure was completed without incident. Dixie recovered within a few days following the procedure, is now behaving normally and able to continue a quality lifestyle. However, as it is almost certain that the tumour will grow back, she will undergo regular checks into the future to detect signs of relapse. If this development occurs, the same procedure can be reattempted if deemed necessary. Find out more about our specialist neurology service or contact us.